The role of the army will remain unchanged in the eleventh parliamentary election, according to Chief Election Commissioner (CEC) KM Nurul Huda. The Jatiya Oikya Front, a new alliance of BNP and several other parties, demanded the deployment of the army with magisterial powers, but its demand fell flat as the CEC announced the plan to deploy the troops only to aid the civil administration. The army will be deployed under what is known as the Aid to Civil Power provision to fortify law enforcement during the election, Huda said. In his speech, the CEC said the Election Commission has completed the process of recruiting about 700,000 officials to conduct the polls. As many as 600,000 members of police, BGB, Bangladesh Coast Guard, Ansar and Village Defence Party will be deployed for law enforcement.The CEC cautioned that special attention would be paid to the efficiency, neutrality and integrity of officials and law-enforcement personnel associated with the polls. 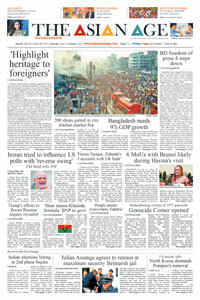 Huda's stance on the election-time duty of the army falls in line with the ruling Awami League's demand for the deployment of troops to assist the civil administration as a striking force.The Awami League has argued that magisterial authority to the army is contrary to the constitution.